NOTE: Product Recommendations is a paid add-on to Zaius. If you do not have access to Product Recommendations in your account, please reach out to your Customer Success Manager. Personalized product recommendations are a powerful tool for driving sales, increasing conversion rate, and increasing order value. Savvy brands use dynamic product content to personalize the offers that are delivered to each customer. Zaius Recommendations employs machine learning to analyze the purchase history of each customer to make smart, data-driven predictions about what they may want to buy in the future. Zaius detects purchasing patterns in your ecommerce data and uses them to automatically predict your customers’ buying behavior, so you can target the right people with the right products. Recommendations are determined based on each user's behavior compared to other users with similar behaviors. The machine learning algorithm runs nightly using event data from the previous 180 days. Zaius Recommendations will be effective for some customers for specific campaigns. However, if you have a solid understanding of your customers, you may be able to better target your customers without the use of machine learning. If a particular customer does not yet have enough behavioral data, Zaius will use default recommendations instead. Those default recommendations are defined by the best selling products from the last week. 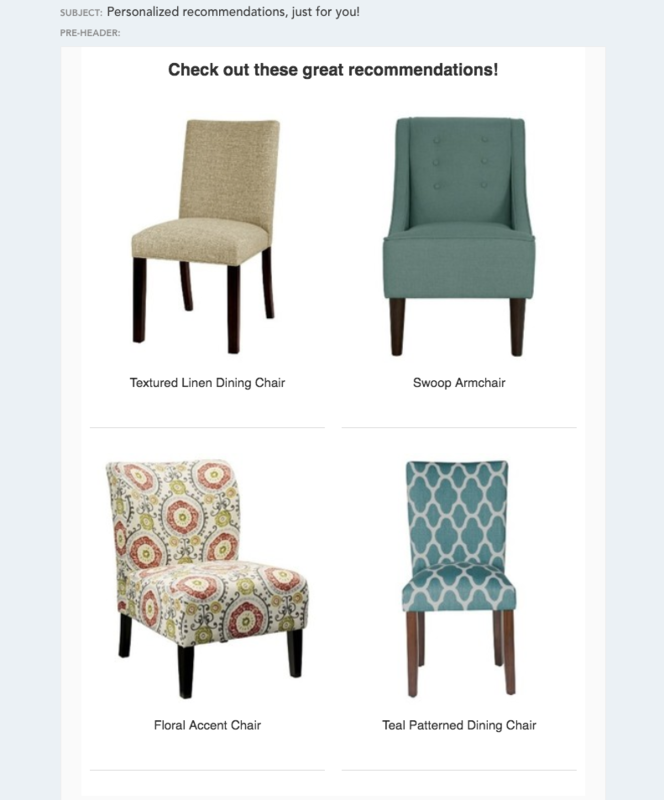 If you see recommendations repeated for several of your customers, you are likely seeing default recommendations. But don't fret! As Zaius collects additional behavioral data about your customers, the recommendations will become further tailored for your audience. 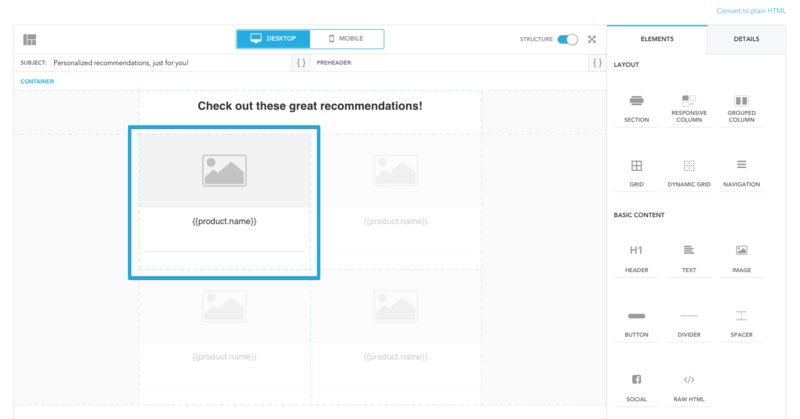 To create a Dynamic Grid based on Recommendations, you must first create the Dynamic Grid. Once the Dynamic Grid has been added, click on the Details tab of the right panel. Select Products from the Feed dropdown. Select any of the four Recommendations options from the Source dropdown. Note that whichever Elements you include in the first cell will be automatically repeated for other cells. Finally, preview the email to make sure it is working correctly.